The oldest known Wormbrain and among the most common. 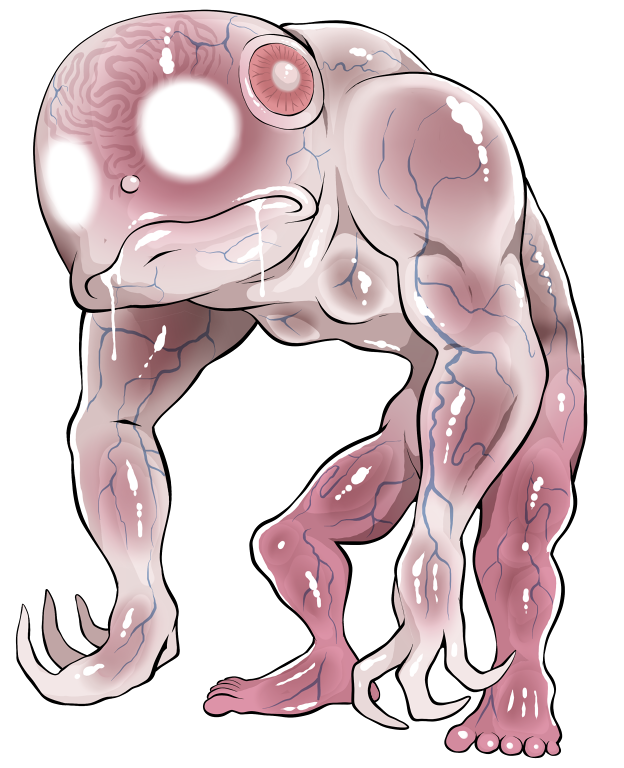 Of all extant Wormbrains, the Sloglobite is believed to be the closest to their ancestral roots; an amphibious hominoid host-beast controlled by the will of a simple, internal colony of relatively tiny brain-flukes. Lacking any external adaptations, the parasites rely entirely on the formidable proportionate strength of their densely muscled host. Omnivorous but toothless, the creature eats whatever it can swallow whole, especially the various eggs, fungi and mollusca that it may find in the cool, wet caverns it calls home. If significantly injured, a Sloglobite may flex a specialized set of muscles to forcefully rupture its own cranium, showering an attacker with infectious brain flukes. The temporarily infested victim may be forced to keep watch over the rest Sloglobite's body, as the creature will slowly regenerate a complete new head and brain over the course of a few days. Sloglobite mate similarly to Anurans, depositing a pile of gelatinous eggs in any available water, each embryo already carrying a mated pair of flukes. The Sloglobite is a largely unemotional creature, simply eating, sleeping and reproducing according to the whim of its parasites. Their collective personality is more curious, driving their host to investigate anything new or unusual within their subterranean territory. For its size, the Sloglobite is thick with well developed, densely packed muscle. Even lacking nails or claws, its tough fingers can gouge flesh like putty and its sheer arm strength can crack apart bones. Decapitation is its preferred method of attack, putting its full weight into throttling the neck and twisting the cranium from adversaries with applicable anatomy. The Sloglobite's eyes shine brightly enough to navigate otherwise lightless environments. 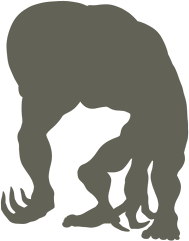 BRUTE STRENGTH: the Sloglobite is one of the strongest of all Wormbrains. CRANIAL BOMB: the Sloglobite can detonate its own head, scattering parasitic worms that enslave hosts to their collective.